(CNN) -- John Reid, a retired businessman, came home from a Caribbean cruise a few years ago with an infected toe as a souvenir. As a diabetic, he knew it was serious, so he went to the emergency room near his home in New York City. There, he says, the first doctor he saw ordered an immediate amputation, scheduling him for surgery right then and there. 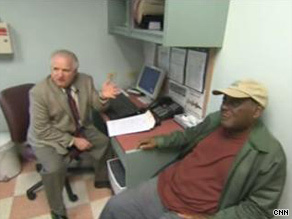 John Reid, shown with his regular doctor Neil Calman, says race played a role during an ER visit. Horrified, he argued with the doctor, insisting there had to be a way to avoid lopping off his toe. "You'd better bring the head doctor in here," he said. Reid says the more senior doctor prescribed a long-term regimen of intravenous antibiotics and physical therapy -- a treatment much more expensive and time-consuming than an amputation -- and saved his toe. Reid, who is African-American, firmly believes that if he'd been a white man, the junior doctor wouldn't have been so quick to order the cheaper and more drastic solution over his objections. "I think it was very disrespectful. As a matter of fact, I think she was looking down on me," he said. "She just decided that, this guy was a minority [and] we're going to do whatever we feel like doing without consulting you." People are already talking. If you missed even a minute of our BIA2 documentary, you can see it again in its entirety. While it's extremely difficult to tell in any given situation how much race -- consciously or subconsciously -- plays a role in a doctor's decision making, multiple studies over several decades have found doctors make different decisions for black patients and white patients even when they have the same medical problems and the same insurance. "It's absolutely proven through studies that a black man and a white man going to the hospital with the same complaint will be treated differently," Dr. Neil Calman, a family physician and president of the Institute for Family Health in New York, said. Calman is also Reid's regular physician. For example, a 2005 study found African-American cardiac patients were less likely than whites to receive a lifesaving procedure called revascularization, where doctors restore the flow of oxygen to the heart. The study authors at RTI International, a research institute, noted that all of the patients had Medicare, which covers the cost of revascularization. In a study conducted in 2007, Harvard researchers showed doctors a vignette about a 50-year-old man with chest pain who arrived at the emergency room, where an EKG showed he'd had a heart attack. Sometimes the researchers paired the medical history with a photo of black man and other times with a photo of a white man. The doctors were significantly more likely to recommend lifesaving drugs when they thought the patient was white than when they thought the patient was black. Is it racism or something else? "Racism in health care is a common experience of people of color," Calman recently wrote on his blog. But he said disparities in medical care are about much more than race. "[Race] is one very important factor in why people get bad medical care," he wrote. "So is poor education, poverty and lack of insurance." Dr. Cornelius Flowers, a cardiologist at the Emory University School of Medicine, in Atlanta, Georgia, agrees there are several reasons for racial disparities in medicine. "It's about respect. If a patient is of a low socioeconomic status, a doctor might think, why do I need to go out of my way for this guy? I'll just do the minimum I have to do and send him on his way," Flowers says. He adds that sometimes African-American patients don't insist on quality care. "Back in the 1950s and 60s, hospitals in places like Atlanta had a black side and a white side, and the care for blacks was second rate," he says. "People who remember those days still consider themselves second-class citizens, and a lot of times they allow people to treat them that way." Flowers said times are changing; younger minority patients are more likely to insist on good care, he says. "Younger people demand better. Younger people demand more," he says. Studies also show that doctors can be biased against patients because of their body size. A study out this week from researchers at the New York University School of Medicine found more than 40 percent of the doctors surveyed had a negative reaction to obese people. "The lesson learned is, I tell people all the time to seek a doctor who will care about you," Flowers says. "If you feel like you have a doctor who isn't genuinely concerned about you, just get another doctor next time." CNN's Caleb Hellerman and Sabriya Rice contributed to this report.